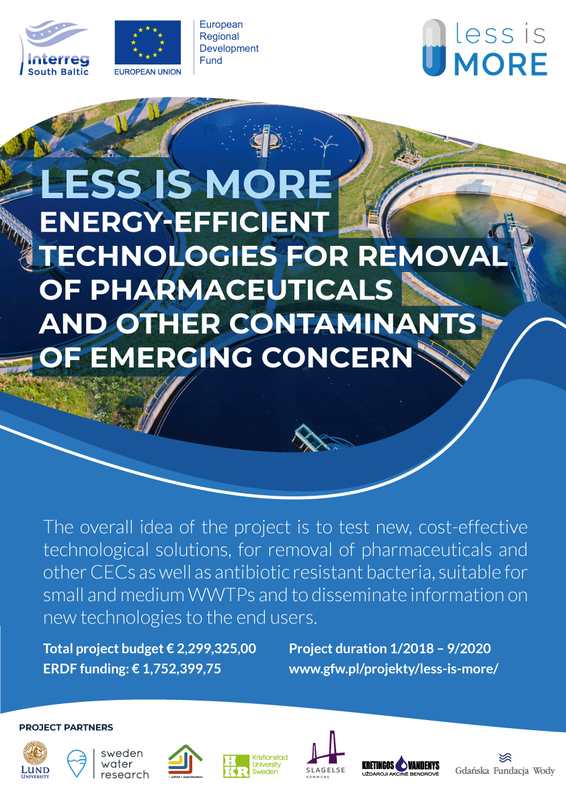 LESS IS MORE – Energy-efficient technologies for removal of pharmaceuticals and other contaminants of emerging concern. Micropollutants, or contaminants of emerging concern (CEC), referring to a number of various substances such as pharmaceuticals, biocides and endocrine disruptors, may have adverse environmental effects, especially in cases with sensitive recipients. Besides impacts on aquatic life, release of micropollutants is a threat to drinking water resources in areas where the access to fresh water for drinking water production is limited. The reduction of micropollutants reaching the wastewater treatment plants (WWTPs) from industries, households and hospitals is poor for a majority of the contaminants. This makes the WWTPs point sources for many of these substances. Therefore upgrading of WWTPs will be needed. Advanced treatment for removal of micropollutants will also enable reuse of water for various purposes. The overall idea of the project is to test new, cost-effective technological solutions, for removal of pharmaceuticals and other CECs as well as antibiotic resistant bacteria, suitable for small and medium WWTPs and to disseminate information on new technologies to the end users. The project’s activities include demonstration, testing and validation of solutions for removal of micropollutants. Three pilot plants will be designed, constructed and installed at WWTPs in Denmark, Sweden and Lithuania. The core idea of the pilots is to develop and test separation technologies based on membrane and activated carbon processes in various combinations. Solutions will be tested for improvement of the energy balance by extraction of organic rest products with high energy content resulting from membrane filtration and reuse it for biogas production. Also, the potential for reuse of treated water will be reviewed. At the final stage a consolidated evaluation report on energy efficiency and cost effectiveness will be prepared. The main target groups are WWTP’s in small and medium coastal municipalities of the South Baltic area as well as decision and policy makers: national authorities and water associations, R&D organisations, SME associations, EU water sector platforms, HELCOM and environmental NGOs. The project has a high transnational added value as it addresses an emerging threat to the South Baltic Sea from micropollutants causing damages on ecosystems including hormonal disorders, behavioural changes and antibiotic resistance. To reach good environmental status as well as to safe guard human health adequate treatment technologies for removal pharmaceuticals and other CECs need to be introduced at WWTPs in the Baltic Sea Region. 1. Pilot investments in technological solutions for removing pharmaceuticals and other CECs as well as antibiotic-resistant bacteria. 2. Solutions focusing on separation processes developed and presented in the form of blue prints and expert papers. 2. technology-driven innovation by developing and testing novel polishing technologies as a fourth treatment step in cooperation with technology suppliers (SMEs). The long-term aim of the project is to reduce the input of CECs from wastewater into the Baltic Sea through upgrading of WWTPs.